ISAAC ASIMOV is one of the greatest science-fiction writers of the 20th Century but his role as an acclaimed mystery writer is often overlooked. To redress this balance, we celebrate possibly his most popular sleuths - The Black Widowers. 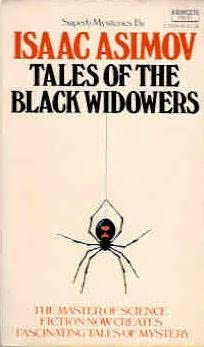 Like all the best fiction, The Black Widowers are based on fact, a real-life organisation called The Trap-Door Spiders, of which Asimov was a member. When Word War II began in 1939, America took an isolationist stance. A decade of poverty and deprivation left an insular nation vastly unwilling to sacrifice its youth in a war somewhere much of its population had never heard about. On 7th December 1941, Pearl Harbour and the death of 3,000 Americans led to the United States entering the war with a vengeance. Isaac Asimov joined the U.S. Navy, though he saw little action. He was mostly stationed at the U.S. Naval Air Experiment Station, where his fellow soldiers included sci-fi giants-to-be Robert A. Heinlein and L. Sprague de Camp. The latter became a lifelong friend of Asimov, and is immortalised in the Black Widowers character Geoffrey Avalon. In 1942, Asimov married, his first wife, Gertrude Blugerman and, after his discharge, he returned to his studies, getting a Ph.D. in 1948, obtaining the post of Assistant Professor in Biochemistry at Boston University. Just 2 years later, Pebble in the Sky hinted at the greatness to come although Asimov's first published work had been in the magazine Amazing Stories eleven years earlier when he was 19. In 1950, he also published his sci-fi short story, I, Robot. It was the first instalment of his seminal Foundation saga, possibly his most famous work. A year later, The Stars Like Dust was published. Despite the demands of a family, Asimov was able to become a full-time writer. During these decades, his output can only be called "extraordinary". In his lifetime he published over 500 works (bested only by Enid Blyton's 600+). He seemed to have one book for every section of the Dewey decimal system - Astronomy, Biology, Chemistry etc. He also wrote junior fiction, firstly under the pseudonym of Paul French, and later (including Norby the Mixed-Up Robot) under his own name with his second wife, Janet Opal Jeppson, the psychiatrist-turned-authoress whom he married in 1973. Crime played little part in this outpouring of science-fiction genius, most of his works were either pure science-based fiction or non-fiction. Part of the problem is the natural human tendency to "pigeon hole" a person according to what they achieve first. His only "mystery" story during this era, A Whiff of Death (Doubleday 1958), dealt solely with science and scientists, emphasising his role as a science-fiction writer. 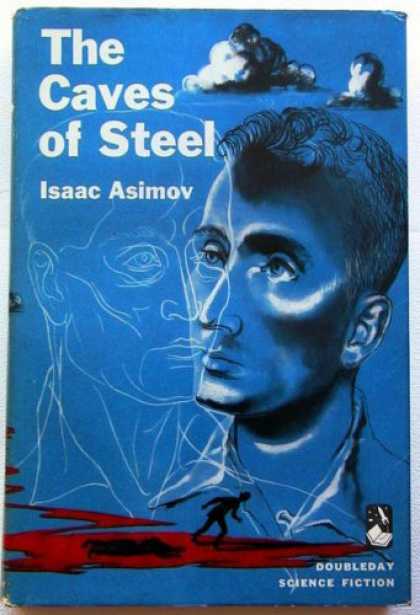 However, in 1953, Asimov wrote The Caves of Steel, a murder-mystery set in the far future, where the hero was a New York police detective named Elijah Bailey. Out of favour with his superiors, Bailey is ordered to solve the impossible murder of Dr Sarton, a Spacer [the technologically superior Earth descended colonists who beat Earth in an ancient war and now rule the galaxy] and is even assigned the man's creation, Robot Daneel Olivaw [Daniel Oliver] as a partner. Daneel looks perfectly human, but robots are hated on Earth and routinely destroyed, placing Bailey in a precarious position. Despite the obstacles in his path, Bailey solves the crime when he discovers that Dr Sarton created the robots in his own image, and the killer's target was not Sarton, but Daneel. The story was such a success that Asimov wrote two sequels, The Naked Sun and The Robots of Dawn, plus Robots and Empire, set 200 years later and involving Bailey's descendants along with Daneel Olivaw. Nevertheless, the books were still classed as science-fiction. The Bailey series was used to highlight many of Asimov's theories on robotics and artificial intelligence, and they are rightly viewed as ground-breaking works even though roboticists today reject Asimov's famous Three Laws because they would prevent robots from serving in the very areas humans would most desire: as soldiers, law enforcement or rescue personnel. A point tragically highlighted on 11th September 2001, when the New York Police and Fire Department each lost nearly 300 people in the attack on the World Trade Centre. Asimov's other great worry was over-population, perhaps a result of seeing the large families in the Brooklyn tenements starving during the Depression. He used the Bailey books as a platform to warn of the danger of unsustainable population growth. Arthur C. Clarke is often called a "prophet" of modern science in his early fiction, but Asimov was equally as perceptive in some areas, the only difference being that Clarke put most of his ideas in one book, 2001: A Space Odyssey, whereas Asimov shared his over several books. However, despite the mystery element of the Bailey series, it was so well received as science-fiction that author Roger McBride Allen completed it after Asimov's death by writing the novels, Caliber, Inferno and Utopia. Things changed when, in the 1940s, a couple married, only for the husband's friends to be unacceptable to the wife and vice versa. Unwilling to relinquish the relationships, the husband and his friends founded a male-only club, called The Trap-Door Spiders. They would meet monthly, always on a Friday night, usually in a Manhattan restaurant or, more rarely, a member's home. Two co-hosts bore the expenses of the evening and, as such, were each entitled to bring a guest. The average attendance at each meeting was about 12 men. Membership entitled one to the honorific title of "Doctor", and each member was supposed to arrange a mention of TDS in his obituary. The club was an outstanding success, continuing long after the founder's divorce rendered it unnecessary, and as far as it is known, it is still going strong in 2001. Asimov himself had been a guest twice, and then, in 1970, he and his wife Gertrude Asimov separated. 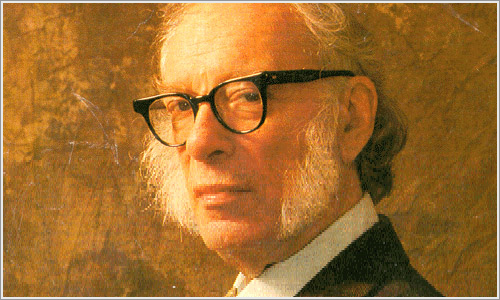 Isaac Asimov returned to live in New York where The Trap-Door Spiders promptly elected him to membership of the club. He was also a member of The Baker Street Irregulars Sherlock Holmes fan society, and this would provide a later Black Widowers story, The Ultimate Crime. A few months later in 1971, Eleanor Sullivan, Managing Editor of Ellery Queen's Mystery Magazine [EQMM] asked Asimov to write a short story for them. He was provided with a plot by his friend, actor David Ford, who told Asimov that he was convinced someone had once stolen something from his apartment, but he could never be sure because the place was crammed with all sorts of collected but uncatalogued oddities, thus there was no hope of telling if anything was missing. The first story was entitled The Acquisitive Chuckle and was published by EQMM in 1971. In it, the evening's guest, Hanley Bartram, is a private investigator who failed to solve one case and recounts it to the Black Widowers. Two men, Anderson and Jackson, became business partners and initially the venture was successful. Jackson was so pathologically honest - honour permeated his soul to the point that it was as if 'he had been marinated in integrity' from infancy - that he became the public face for the company, whilst Anderson, who was as unscrupulous and unethical as his partner was honourable, looked after the money which was his area of expertise. But problems arose: Jackson's immense integrity meant Anderson was sometimes pushed into situations where he lost money, while Anderson's greed meant Jackson was sometimes placed into situations of dishonourable practice. Since Jackson hated losing character, and Anderson abhorred losing money, their relationship deteriorated until Anderson managed to force Jackson to sell him his half of the business under the most disadvantageous of circumstances, leaving Jackson virtually penniless. Bartram was hired by the furious Anderson on a considerable retainer to find something he claimed Jackson had stolen. Anderson was acquisitive, a collector of all sorts of oddities and bric á brac that he stored in the large mansion that also served as his office and home. Jackson had sworn revenge after the dissolution of the partnership and one night, Anderson arrived home to find 'honest' Jackson in the mansion; Jackson claimed to be returning some papers and the office key, which he did, before closing his old attaché case and leaving. As Jackson closed the door behind him, Anderson heard him chuckle, a chuckle Anderson, with thirty-plus years of acquisition knew. It was the chuckle of a man who had just obtained something he wanted very much at the expense of someone else. Furious, Anderson knew Jackson had stolen one of his oddities and was determined to retrieve it. However, like David Ford's apartment, his mansion was crammed with all sorts of junk, most of which was small enough to fit inside an attaché case. Anderson had no idea what he possessed and what he didn't. Despite five years of trying, Bartram had been unable to discover what Jackson had stolen that day. The denouement comes when Bartram introduces the Black Widowers to their waiter, Henry Jackson. Henry still was a pathologically honest man - what his carefully choreographed revenge enabled him to steal from Anderson that day had not been material treasure, but Anderson's peace of mind - Anderson going to his grave in the belief that Jackson had outwitted him. Asimov intended the story as a one-shot, and it might have ended there, had it not been for Frederic Danny, one of the two authors who formed 'Ellery Queen'.. Dannay firmly believed that the story would make an excellent series and encouraged Asimov to keep writing them, which he did, although Dannay, who died in 1982, did not live to see the later ones. Periodically after serialisation, the stories would be collected into one anthology. There were five books which contained twelve stories each: Tales of the Black Widowers, More Tales of the Black Widowers, Casebook of the Black Widowers, Banquets of the Black Widowers and Puzzles of the Black Widowers. The stories are definitely cerebral as opposed to the "three bodies per chapter" type. The opening story has the reader trying to figure out what items would fit into a small attaché case, and the twist where Jackson steals only Anderson's peace of mind is wonderful. Only one story, Early Sunday Morning (Tales of the Black Widowers) deals with murder, and then from a perspective of three years' distance. Nothing Like Murder (More Tales of the Black Widowers) was a tribute to the fantasist J. R. R. Tolkien, who died in 1973, although the story has nothing to do with murder. The stories can sometimes be repetitive in setting - originally written as serials for EQMM, Asimov had to reiterate names, features and characteristics for the benefit of new readers and as reminders for old ones. His copy editor helped him to eliminate the more tedious examples, but those that are left are well worth putting up with considering the general excellence of the stories. The fact that Asimov was a bona fide scientist was his greatest strength as a sci-fi author, but was of less of a benefit to him as a mystery writer. Sometimes he got too involved with his obsessions or some obscure scholarly point. Asimov was extremely anti-religious (especially Christianity) and attacked religion in his stories in ways that were 'often [so] subtle the [usual] reader may never notice.' (Michael Hammond, Religion in Asimov's Writings). Some may argue that he should never have written them - the whole point being that the reader should be able to follow what the author is saying. Asimov wrote in such wide areas of literature that he often got letters saying, "why do you, a Shakespearean scholar, write science-fiction?" or, "why do you, a biochemist, think you know anything about Shakespeare?" This erudition gave him masses of material for his stories, but it also meant Asimov could write at too high a level for any but a specialist to understand. An example of this is the "solution" to the Black Widowers story Truth to Tell, which hinges on an extremely obscure point of linguistics and which would probably only be amusing to a linguistics professional. His prejudice against religion in general intrudes into the Black Widower story The Obvious Factor, where Asimov sets up the story so there can only be a supernatural solution, only to have the protagonist cheat and admit he made it up - a cop-out ending similar to the "with a single bound he was free" cliché. Such actions ruin our "suspension of disbelief", our ability to lose ourselves in the story. Asimov's anti-religious snippets can be irritating in his works, especially in the shorter tales like the Black Widowers, but they are well worth taking with a pinch of salt and the astute reader will not let them detract from what is otherwise excellent story-telling. 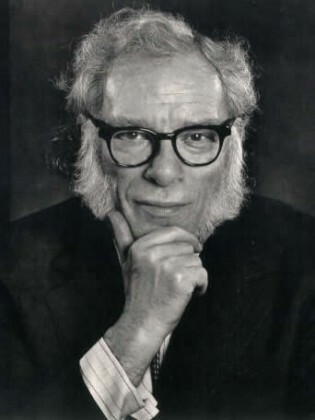 For those really annoyed however, keep in mind that, for all his protestations and sarcasm about those with open religious beliefs rather than hiding what they were, Asimov himself was religious - Science was his god; he simply cloaked his worship with phrases like "rationalism" and "humanism". He was also lured into pseudo-sciences like psychohistory. What the Black Widower stories accomplish so well is that they are intriguing. Like all the best puzzles they have the reader cranking up the "little Grey cells" in an effort to outwit Asimov's denouement at the end of the story, and they are challenging.. Perhaps most importantly, they got Asimov's own "little Grey cells" working too. 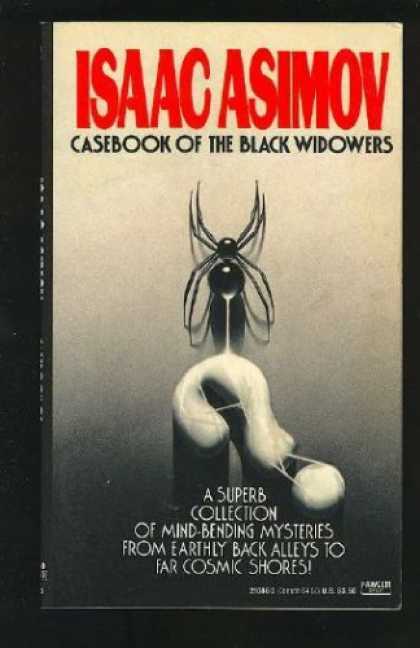 The first Black Widower story was in 1971, and after his two previous abortive attempts at murder-mystery fiction (A Whiff of Death, 1958 and Asimov's Mysteries, 1968), they helped him to become an accomplished crime writer as well as a prolific one. The novel, Murder at the ABA was published in 1976. Whilst, as well as the Black Widower anthologies (1974, 76, 1980, 84, & 1990) he wrote several other short-story mystery anthologies [The Key Word & Other Mysteries (1977); The Union Club Mysteries (1983); The Disappearing Man & Other Mysteries (1985) and The Best Mysteries of Isaac Asimov (1986)] all of which were published in the 21 year period from the first Black Widower story in 1971 to Asimov's death, aged 72, on 6th April 1992 He also wrote the junior fantasy-mystery novel, Azalea in 1988 and would have continued the Black Widowers had he lived - we must therefore mourn for the mysteries they, and we, never got to solve. 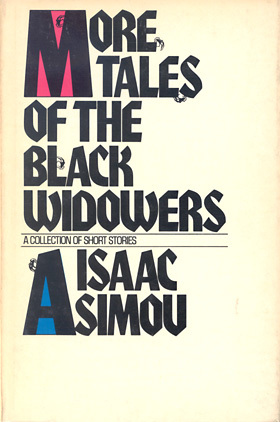 The Black Widowers have not achieved the same heights of fame as Asimov's science-fiction works, such as Foundation or the Robot series, and this is regretful, for they are well-written, highly enjoyable examples of just how good a mystery writer Isaac Asimov was.